[New Stuff at Easy Oil Painting! ], Issue #006, painting videos and canvas prep questions answered. 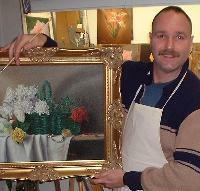 * A new demonstration on painting silver and a pink rose! * Talent, and it's role in painting. * Photographing your own work. * Invitation pages taking off! As I put this months issue together, I'm hoping your Holidays were both wonderful and a blessing to you. My heart is heavy however as we are just getting word of a terrible crisis in Haiti. Please remember them today. This months edition will point you to several articles that were added to the site, but didn't make last months e-zine and some very fresh stuff just posted this week. Ever tried to paint silver? It's really not that hard, you just gotta remember a few things. I've included a cute little pink rose in this painting also, so check it out. It's a 2 page demonstration with over 20 photos and closeup views of paint application. Talent and its role in painting. Still thinking you have to be born with talent to become a artist? This article explains once again, my belief that anyone, yes anyone can learn to paint not just well, but very well! When ever I look back on my travels within the art realm, I'm reminded of the times when I received encouragement at just the right times to continue down this path. Check out what this author has to say on the subject. An artist career? got talent? This article explains the steps I use to photograph my work, both for a portfolio and the website. It's explained in easy terms and shows step by step how to do it. I even have additional information about camera's in that section of the site too! You'll really appreciate my computer art stick people! These 2 pages are really off to a good start with some great participation. The paintings are beautiful and the reference photos are exciting! Come on and join the group in adding yours. You should really see the photo John contributed of the Bird of Paradise bloom in Korea. Your reference photo's for others! New video clips added. One on answering the many questions about store bought canvas's, and one on how to paint a rose! Nicely done, and worth the 10 minutes each that it takes to view them. Enjoy! And finally, if you've enjoyed my site, and have learned some new skills, pay it forward for me. Tell your friends, art companions and art teachers about the site. I could always use more insight in this wonderful past time, and enjoy getting emails from you. By chance, if we where to meet in the local town center, and we just finished discussing the layout for a great painting idea, would you treat me to a cup of coffee? A friend (a true webmaster) turned me on to this idea, so I'll just post it here. Rather than bore you with asking for a donation, think about this. After our talk and your visit to the site, help me continue to provide good information. Treat me to a cup of coffee! Just click on the coffee cup!